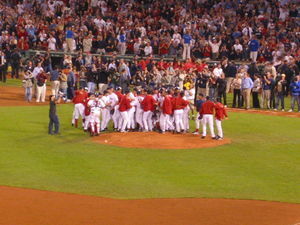 2013 World Series: Boston leads 3-2… what’s next? The Boston Red Sox are one win away from winning the 2013 World Series. They won last night 3-1 and now go back home to try to end the series in front of their hometown fans. The series continues on Wednesday night. So, can the Cardinals win two games on the road to steal the series from the BoSox? Or, are the Red Sox about ready to celebrate? Let’s try to put some numbers to the crystal ball. The Red Sox and Cardinals were tied at 2-2 after four games. It was the 21st time since 1960 that the World Series was tied at two games apiece. So how did the previous 20 series end after Game 5? In the previous 20 series tied at 2-2, five ended with the team winning Game 5 and Game 6. In seven of the series, the team that won Game 5, lost Game 6, but won Game 7 to clinch the series. In eight of the series, the team that lost Game 5 went on to win Games 6 and 7 to win the World Series. Bottom line: The team that won Game 5 after the series was tied at 2-2 won the World Series 12 times and lost eight. While this bottom line stat favors the Red Sox, the most frequent scenario in the past 20 series tied at 2-2 was that the team that lost Game 5 won the next two games and the series (that happened eight times of the 20). But let’s dig a little deeper and look at what has happened since 1990. There were seven World series since 1990 where the two teams were tied at two games apiece going into Game 5. Four times (1991, 2001, 2002 and 2011) the team that lost Game 5 went on to win the next two games and the series. Twice (1996 and 2003) the team that won Game 5 also won Game 6 and won the World Series. The only time since 1990 that the team that won Game 5, lost Game 6 and then came back to win Game 7 was in 1997. The above stat seems to favor the possibility of the Cardinals coming back to win Games 6 and 7. One problem… In those four games above where the team that lost Game 5 went on to win Games 6 and 7 to clinch the world championship, the team that won Game 5 was the home team. The Cards were the home team last night and lost Game 5. In the two cases where the road team won Game 5 in a World Series tied 2-2 since 1990, both times the away team that won Game 5 (which the Red Sox were last night) went on to win the World Series (once the series went six games; the other time the road team won Game 6 but the home team rebounded with a Game 7 victory). That’s a lot of numbers and scenarios. Is it possible for the Cardinals to win two games on the road to win the series? There is a glimmer of hope because it has been done before. The last time it happened was in 1979 when the Pittsburgh Pirates, down 3-2 in the World Series, had to win Games 6 and 7 in the Baltimore Orioles ballpark to win the championship. They won Game 6 by a score of 4-0 and won Game 7 and the World Series with a 4-1 win in the finale. Can the Cardinals take a piece of history and repeat the Pirates 1979 World Series comeback? Hello NBA 2013: Which teams are on the rise? The 2013-14 NBA season begins tonight as the Miami Heat will try to become the first team to three-peat in the league since the Lakers did it in 2000, 2001 and 2002. There’s a good chance the Heat will be one of the teams at the end of the season challenging for the title, but what about a team or two to keep an eye on for this season? Here’s a look at the teams that made the biggest improvement in winning percentage last season (and those who dropped the most). While the Nets had the biggest gain in winning percentage last season, two teams increased their winning percentage for the fifth straight season last year. The Memphis Grizzlies and Oklahoma City Thunder each increased their winning percentage again last year over 2011-12, giving them five straight seasons of an improved winning percentage. For the Grizzlies, they have gone from a .286 winning percentage in 2007-08 to .293, .488, .561, .621 and .683 last season. The Thunder have gone from .244 in 2007-08 to .280, .610, .671, .712 and .732 last season. The Los Angeles Clippers improved their winning percentage last year for the fourth straight season, while the Nets and Knicks last year improved their winning percentage for a third straight year. Last season the Dallas Mavericks were the only NBA team to finish the season at .500 (they were 41-41). Sixteen teams were above .500 and 13 teams were below the .500 mark for the season. For the San Antonio Spurs, their winning percentage of .707 last year gave them 16 consecutive years with a record above .500, longest streak in the NBA. They are followed by Denver (10 straight seasons above .500), Los Angeles Lakers (8), Houston (7), Boston (6) and Atlanta and Miami with five. In the sub.500 category, the Minnesota Timberwolves were only 31-51 last season (a winning percentage of .378) It was the eighth straight year under .500 for the ‘Wolves, longest current streak in the league. They are followed by Sacramento (7) and Detroit, Toronto and Washington each with five straight sub .500 seasons.